Gond, besides the laddu form, is also eaten as a panjiri mixture. One traditional mithai I remember being made at home every winter is Gond laddus. Every winter all of us would have one laddus every day without fail. It was almost like a habit. Today I don’t see too many people make it or have it. In fact, most people don’t even know about it. That’s a pity because there’s a lot going for it. So what exactly is Gond? It is a natural resin – a tasteless, odorless, viscous water-soluble natural gum got from axle wood tree, called 'dhoy' in Hindi and 'Dhaka' in Sanskrit. The tree has many other names – it is called Kothri in Bengali, Gondh in Tamil, Gaundh in Rajasthan and Dink in Marathi. Gond, besides the laddu form, is also eaten as a panjiri mixture (the ingredients used in both are almost the same. In both these recipes, gondh is mixed with whole wheat flour, sugar, ghee and nuts (usually cashews, almonds and raisins), sugar and cardamom. First, the gond is deep fried in ghee wherein it puffs up and gets a wonderful crunch. The benefits both the laddu and the panjiri are due to all the ingredients (gond, whole wheat, muskmelon seeds, cashews, almonds, cardamom, ghee and sugar) that go into making them. They are a warming food, so they provide warmth internally to the body during dipping temperatures. These laddus strengthen and nourish the bone tissues as it is rich in calcium, magnesium and also delivers some protein. They help in lubricating the joints and reduce back pain along with other joints pain. That is why it is given to pregnant women to nourish them, help them develop strong bones and to prevent back pain. Gondh laddus are rich in fat and fibre and calories and are thus given to lactating mothers to build their immunity, to meet the extra calories needed by a new mother while she’s breastfeeding the new-born, and to speed up recovery and provide her with vital nutrients to regain her strength after delivering a child. Gondh is also said to increase the production of breast milk. Although there is no clear research proving this claim but the benefit of this wonderful natural gum for lactating mothers is apparent. These laddu’s build our immunity against cold and seasonal viruses and keep us safe from winter illnesses. As they are usually made with very nutrient dense ingredients like gond, whole wheat flour, ghee and nuts, they are a perfect energy giving food for children. And of course, they help maintain and promote stamina, strength and stability of the body for adults too. Since gond is a heat producing food, it is best had during winter months. 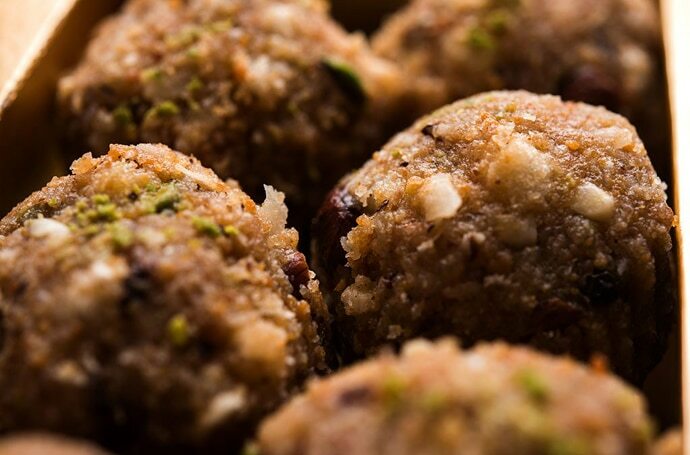 Also as they are made with nuts and loads of ghee they tend to be rich in calories – one single laddu has more than 200 calories so have in moderation. Pregnant ladies too should not have more than one a day (as it is heat producing). My suggestion is to eat one to two gond ke laddu every morning/bedtime with milk and if you are counting calories restrict to one, but definitely have it during winter months. 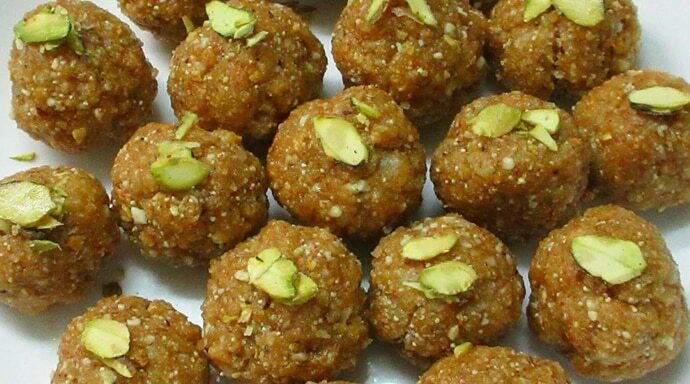 Eating gond ke laddu and many such old traditions confuse the new-age people. But there is a lot of wisdom hidden in age-old traditions and must be followed. Of course, modifications can be made. For example sugar can be replaced with jaggery or maple syrup, which will add even more benefits to the laddu due to their mineral and antioxidant profile. If you don’t fancy sweets, you can even mix gond with other herbs like methi dana, sauf, black pepper, till seeds and ajwain and relish namkeen laddus. There are any major side effects, but excessive intake may cause mild abdominal discomfort. Also, it’s advisable if you are taking gond (in any form) you should drink plenty of water to keep the stomach humming along. Finally, don’t confuse gond with gond katira (Tragacanth Gum), both are different in fact they have opposite effects, gond is heat producing whereas gond katira cools the body.